Does having asthma increase your likelihood of tooth decay? According to research in the latest issue of the Journal of the American Dental Association the answer is "no." This research was a literature review or a "study of studies." Many of these studies had hypothesized that there was a causative connection between asthma and tooth decay but data didn't support this hypothesis. 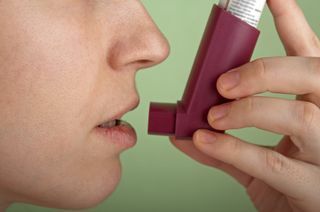 Inhalers used in the treatment of asthma can cause a dry mouth. Dry mouth is a major risk factor for tooth decay. To be clear, this research determined that having asthma isn't a risk factor for tooth decay, but using inhaler medications is a risk factor for dry mouth and dry mouth is a risk factor for tooth decay. If you use inhalers I would recommend chewing sugarless gum after their use to bump up your saliva flow. Along with regular brushing and flossing these precautions should help protect you against any drying that might occur from this medicine. Do you have dental topics you'd like me to research and discuss? I'd be happy to! Feel free to drop me an email at alan@meadfamilydental.com. I take requests!